Based in Iver, Buckinghamshire, Beechwood Interiors has a fully equipped workshop including a machine shop that can deal with a wide number of materials and also a spray shop that applies both modern and traditional materials. The workforce includes an NIC Qualified Electrician, a Corgi Registered Plumber and a team of experienced carpenters, cabinet makers and decorators. 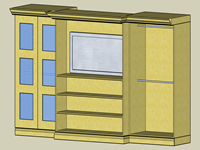 We make extensive use of 3D computer modelling and produce detailed construction plans. Beechwood Interiors are willing to undertake any size of project, from a single item of furniture to complete building restoration. 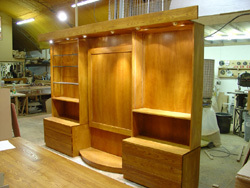 We work with you to produce original items of furniture from planning/design to completion. The first original idea from which others can only copy.